You will need to have a current stereo system (like the Sherwood shown below) that will allow you to use the Surround Master v2 as a replacement for the internal surround sound. To do this you will connect the stereo system outputs to the Surround Master v2 inputs. 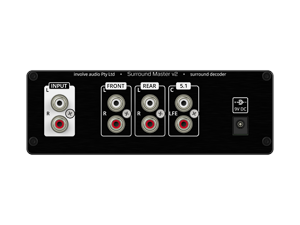 There are a number of compatible stereos that you can use with the Surround Master v2. Here is a sample of a common front and back panel of a compatible sound system! This is the Sherwood RD 6500. A fairly common middle of the road consumer amp. When you connect a Surround Master v2 to it, turn off the default processing and listen to the result, you will never want to listen to anything else. Notice the 6-CH Direct Input plugs on the left side of the back panel. 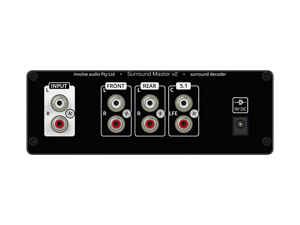 This is where you would connect the out from the Surround Master v2 into the corresponding left, right, center, rear and sub-woofer inputs. Then turn off all surround sound modes (normally called “bypass” or “direct”) and you are ready to go.